Your location is not accurate due to your location being OFF. Please enable location from settings or type your location in the search box above. © Lenovo 2019. All rights reserved. Lenovo and the Lenovo logo are trademarks of Lenovo in the United States, other countries or both. All Images shown are for Illustrative purposes only,and might not resemble the actual product. Ultrabook, Celeron, Celeron Inside, Core Inside, Intel, Intel Logo, Intel Atom, Intel Atom Inside, Intel Core, Intel Inside, Intel Inside Logo, Intel vPro, Itanium, Itanium Inside, Pentium, Pentium Inside, vPro Inside, Xeon, Xeon Phi, and Xeon Inside are trademarks of Intel Corporation or its subsidiaries in the U.S. and/or other countries. © Lenovo 2018. All rights reserved. Lenovo and the Lenovo logo are trademarks of Lenovo in the United States, other countries or both. All Images shown are for Illustrative purposes only,and might not resemble the actual product. Ultrabook, Celeron, Celeron Inside, Core Inside, Intel, Intel Logo, Intel Atom, Intel Atom Inside, Intel Core, Intel Inside, Intel Inside Logo, Intel vPro, Itanium, Itanium Inside, Pentium, Pentium Inside, vPro Inside, Xeon, Xeon Phi, and Xeon Inside are trademarks of Intel Corporation or its subsidiaries in the U.S. and/or other countries. How did you know about the offers? Please Upload file below 2MB. Please Upload the Format in JPEG,JPG,PNG,GIF,PDF. Ensure serial number is mentioned in the Invoice before uploading to avoid rejections. For ADP & warranty update you can check on the following link for your latest status. 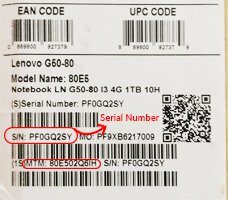 Are you sure the serial number was typed as in the barcode sticker or laptop behind? Please also ensure that the serial number is available in the invoice & matching with the barcode sticker or laptop behind for Approval of this offer. Does your Invoice have the below? Offers at www.buyalenovo.com is valid for Laptop Quantity of 2 or less.